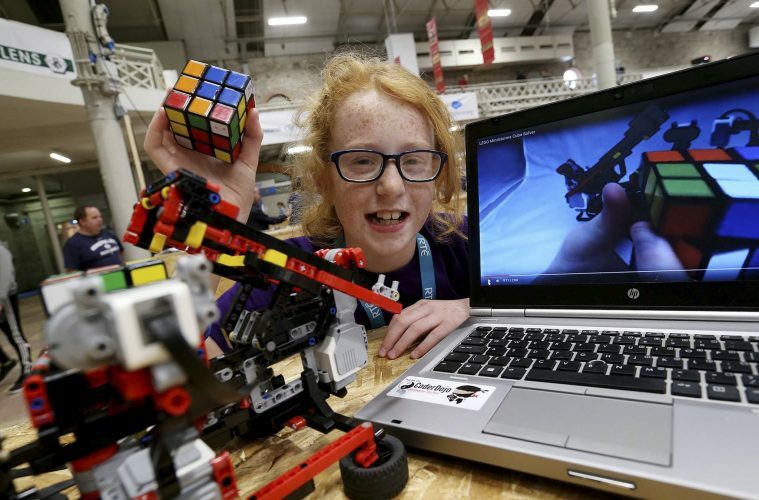 A Rubik’s Cube-solving robot built by 11-year-old Katie Reilly was among the top winners at the CoderDojo Coolest Projects Awards at the RDS. Over 10,000 people attended Ireland’s largest technology event on Saturday, to witness flood warning systems, robotic dog feeding apps, and mobile phones that don’t require a network among the inventions revealed by 800 young innovators aged between 5-17. Katie built and programmed a Lego robot that completes the puzzle automatically, along with a Rubik’s Mania website devoted to the coloured cube. Solving the Rubik’s Cube in 15 seconds was only the start of the journey for the Dublin 15 CoderDojo member that led to her winning in the AOL Websites category. “I wanted to create a site that detailed the full history and different types of cube, along with instructional videos on how to solve the puzzle. And wowing the judges on the day was the fact that the site featured original videos of her own robot completing the cube in minutes. “I built the robot from Lego and coded it in Lego’s own Mindstories language,” said the Bishop Galvin Templeogue schoolgirl. 12-year-old Jasper Brezina Coniffe from Dublin’s Warehouse Dojo was a winner in the Liberty Global/Virgin Media Future Makers category with Everyfone, a low-cost phone for developing countries that does not require a network. And not to be outdone, Jasper’s brother Harvey (14) took the Accenture Innovator’s Special Prize for his invention startups.coderdojo.xyz – a website which allows kids in CoderDojo to get a website up and running in minutes. A Flood Gauge warning system invented by 11-year-old Shay Fahy from Athenry designed to alert whole communities and surrounding areas by email or tweet when flooding is imminent was a winner in the Intel Best Hardware category. “It was fantastic to see 100 entries from outside Ireland at Coolest Projects. We now have 1,020 dojos in 63 countries and reach 35,000 children a week,” said Coolest Projects co-founder Noel King. “Coolest Projects provides the bridge from learning coding skills at local CoderDojos to innovating and creating future employment. We are the piece in the middle which makes the connection. This year also saw the introduction of Launch’d – an event over four stages featuring 50 top international speakers as well as 100 of Ireland’s top tech start-up companies. Launch’d is aimed at inspiring and supporting the next generation of technology entrepreneurs and was an essential platform for the Coolest Projects kids, tech professionals and anyone considering a career in coding. Among the speakers was Seattle-based Dubliner Aidan Hughes – the developer of of the world’s most popular calculators, with more than 70 million combined downloads and 11 million monthly users. Michael Hunger, caretaker of the Neo4J community, talked about how his organisation helped to unravel the Panama Papers.